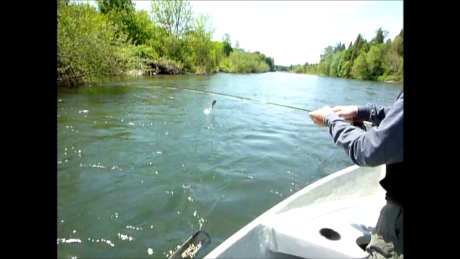 Releasing a nice McKenzie River "Redside"
Windy was the report!!! The day was filled with some serious winds! It seemed that the winds were sustained at about 20-25 knots all day long, and the biggest breaks we were getting were bends in the river that were blocked from the brute force winds. Every time we got into a spot, and the wind was calm we had take downs on the strike indicator, or lines tightening up on wet fly swings. When we fished in the spots where the wind was howling, we lacked action. It was an interesting direct correlation with wind and fish action; where the spots that we had good action lacked wind, and the spots where we lacked action were windier than you could imagine. Fish were caught nymphing on golden stones, mega princes, and possie buggers, and it seemed that the nicest fish were eating nymphs. Swinging wets shined at times, and we did get into the nicest McKenzie Redside of the day on a swung McKenzie green caddis wet fly that I tie for my clients to use on my trips. While swinging wets, we also caught fish on Red Butted Peacock Softhackled wet flies . The Chernobyl Chubby Norm did get some surface attention while fishing a dry fly and dropper nymph, but not enough to warrant using it more than a trial run in a spot or two. The McKenzie green caddis was not out hatching, but we did catch a few fish on the wet fly imitations; so it seemed like the fish have been seeing some of them out by the way that they took the pattens with authority. 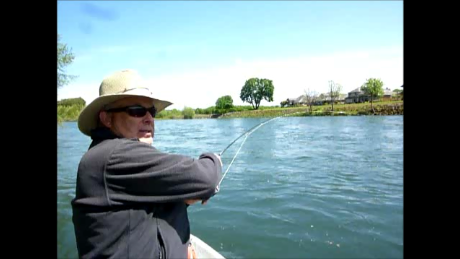 Fishing will only improve as long as weather and water levels cooperate. 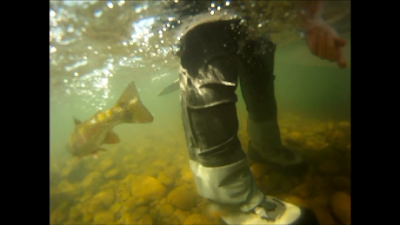 The best fishing for trout on the lower McKenzie is from here through the next several weeks; so book yourself a trout guided trip to experience the McKenzie's famous "redsides".